Let’s celebrate! There have been lots of great accomplishments in 4-H this year and it is time to celebrate with our 4-H Achievement Night on February 28, 2019, at 5:30 p.m. at the Center for Active Adults. We will be celebrating project record books, the number of years in 4-H, club successes, and the ways we are growing 4-H in Camden County! All youth who completed a project record or participated in 4-H this year are invited to come and be celebrated! There will be refreshments provided. There is no registration cost, but RSVP is required by February 25 so we can plan appropriately. 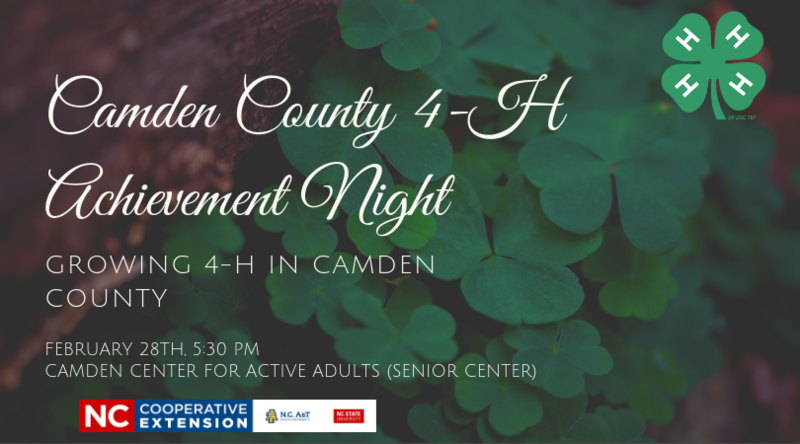 We look forward to seeing you there and celebrating 4-H growth in Camden County! For accommodations for persons with disabilities, contact t.C. Cooperative Extension, Camden County Center at 252-331-7630 or email Ali_Huber@ncsu.edu no later than five business days before the event. • Join 4-H for Achievement Night!